False gods war within each and every one of us, fighting for a place of glory and control in our lives. In this student edition of gods at war, Kyle Idleman, bestselling author of not a fan, demonstrates how the desire for things like popularity, acceptance, and success can become modern-day idols that keep us from truly following Jesus Christ. Behind the everyday pressures, fears, and lack of purpose is a false god who too often is winning the war in our hearts. By asking insightful questions and looking at the issues from a teen’s point of view, Idleman reveals which false gods most often take the place of the one true God. 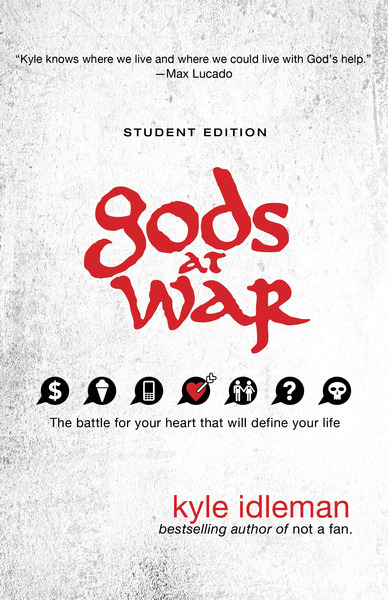 Then, using powerful and honest testimonies of people like you who have struggled in each area, gods at war student edition illustrates a clear path away from the heartache of 21st-century idolatry back to the heart of God.